For many people, a good Christmas party is the highlight of their social calendar. It is a time when they can let their hair down, relax with friends and enjoy themselves. 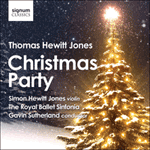 In this piece, the violin solo is the life and soul of the party. It plays host, greeting and introducing the guests as they arrive, one by one, in the form of Christmas carols, each with their own distinctive characters. The first on the scene is a popular, exuberant tune, Joy to the world!, and it’s a fantastic ice-breaker. Next to arrive at the party is an English folk song, I saw three ships, which heads straight for the bucks fizz. Skulking around slightly nervously is the old nursery rhyme, Christmas is coming, the goose is getting fat. But the drinks are flowing and everyone is in festive mood when the Yorkshire Wassail song, Here we come a-wassailing, joins the celebration. The guests at this Christmas party come from far and wide. They include a beautiful, gentle Polish carol, Hajej, nynej, Jezísku (Little Jesus, sweetly sleep, do not stir), a softly spoken French carol, Quelle est cette odeur agréable? (Whence is that goodly fragrance flowing? ), and the universally popular German folksong, O Tannenbaum (O Christmas tree). But a party is not a party without dancing, and so this seasonal entertainment is rounded off with Tomorrow shall be my dancing day.